ALERT!! INVASIVE SPECIES – PENDING THREATS! Contact a member of the Ecology Committee if you suspect an invasive plant at BWL! These invasive species are potential threats to our Big Whitefish Lake waters and the surrounding lake basin. There is an opportunity to “nip these species in the bud” if they are properly identified early and treated or removed by environmental specialists. Help protect our water and shoreline! 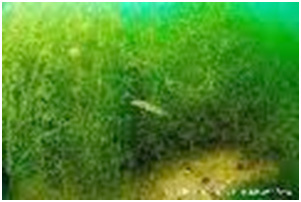 Habit: Perennial, free-floating aquatic herb that forms large colonies, creating dense mats with tangled roots. Leaves: Usually floating, kidney shaped with long stems, dark purple below, resemble tiny water lilies, 1-6 cm (0.5-2.25 in) across. Flowers: White in color, cup-shaped, three-petaled with yellow dots at the base. 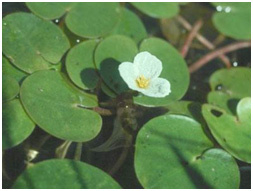 This species is on the Michigan prohibited aquatic plant list. Appears in July and increases through October. Habit: Aquatic microalgae with smooth, irregular branches; rootlike rhizoids. Forms dense mats that cover lake bottoms. Leaves: Whorls of 5-8 fine, uneven-length branches arise at an acute angle from nodes. Contents can be squeezed out of tube-like cell wall when cut. Stems: May reach 33” in length. PHRAGMITES: Phragmites, the common reed, is widely distributed around the globe. In Michigan two subspecies are present – a native species and an invasive form that is capable of dominating wetlands within a few years. The non-native species is already a scourge in southern Michigan in the Saginaw Bay and St. Claire area. Efforts are underway to slow further spread in Michigan. It is important to distinguish between the native grass and the invasive subspecies. Click on the link below to see the differences. If you’re not certain, please contact an Ecology Committee member to assist you.